Updated below with a new statement from LinkedIn. This article has been updated to include LinkedIn’s account of events. Earlier today we looked at an interesting incident which saw LinkedIn revoke access to its API for Pealk, a France-based startup which developed a headhunting application that hooks into its data, concluding that there were a number of questions left unanswered. LinkedIn says it is cutting access next week because the app threatened its members’ data, despite prior warnings. That led us to wonder why a company that relies on API access knowingly refused to alter its service to comply with the terms of service required of it. The short answer is that, as we suspected, 5-man startup Pealk did try to adapt itself to support LinkedIn’s terms; but the longer answer is a story of how the global professional social network toyed with, and then betrayed, a small team, in a case that should concern any developers that work with the company. 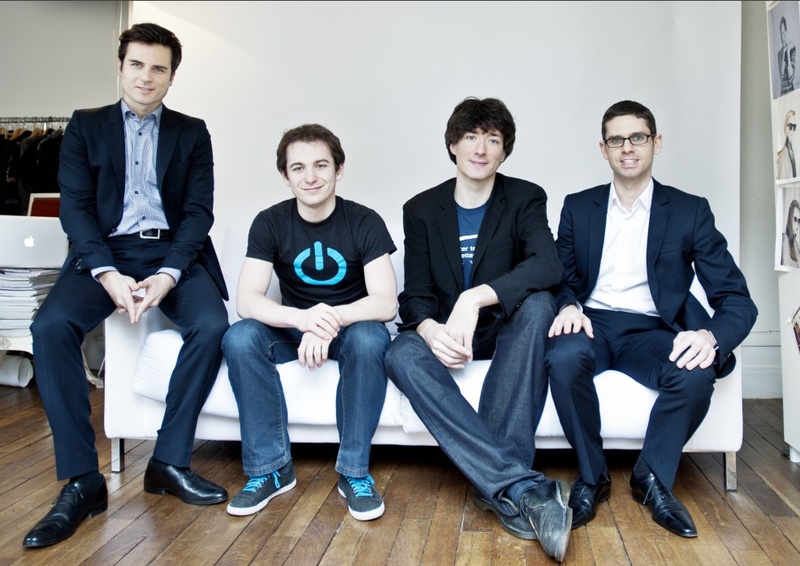 The story began back one year ago when Pealk’s Boris Golden (pictured third from left below) and his three fellow co-founders began to put the idea for an app into motion. Through work with a previous startup, which saw him use it daily, the serial entrepreneur had built a comprehensive list of strengths and weaknesses of LinkedIn. Having identified the need for a “productive and a cool tool to explore the data”, the concept of Pealk was born. The Web app was released in beta two and a half months ago but, Golden told me, the team had essentially spent a year working on the concept – clearly time that the four founders don’t want to put to waste. The app — which today has some 2,500 registered users — made promising strides filling a niche need for headhunting on LinkedIn, offering recruiters a range of features that included a quick browser that allows for looking at multiple user profiles at one time, eliminating the need for multiple tabs sessions. Early on, the app attracted the attention of LinkedIn’s own staff who began to engage with positive feedback. Even on the call that informed them of the shutdown, LinkedIn told the now 5-man Pealk team that they “really love the features, its marketing” and the app in general. LinkedIn began to talk more specifically with Pealk about collaborations and, in particular, held a number of conference calls to discuss a possible ‘partnership’. While the nature of how the two companies might collaborate was always left open ended, at no point did LinkedIn execs ever reveal that it was breaching its term and conditions. The revelation came out of the blue. Last week, following a new round of partnership talks, the company was contacted by LinkedIn with a request for a conference call to discuss closing down its access to the API with immediate effect. Golden, who is head of product at the startup, managed to negotiate a two week extension but admits that he is baffled by the u-turn. As email exchanges between the two firms passed to The Next Web indicate, Golden was open with his determination and offers to change the Pealk app in order to pass LinkedIn’s requirements and keep it open. Yet the company declined to make this possible. A couple of additional details began to paint a concerning picture around the way LinkedIn conducted itself in its exchanges with Pealk. After news of the API cut off, LinkedIn got in touch to suggest a possible trip to its Mountain View HQ and potential projects for the firm, while asking more about Pealk’s structure. In turn, Golden revealed that the firm was self-funded with one angel backer, numbered 5 employees and other details. LinkedIn asked if the startup had VC backers (it doesn’t), prompting the suggestion that an official collaboration, or perhaps even acquisition/hiring, could be on the cards. Also, notably, the guys at Pealk noticed that a member of LinkedIn’s design team had spent “significant time testing all of the app’s features”, Golden recalls, to the point that he generated an obscure bug which — when looked at in more detail — alerted Pealk to exactly who he was. While it is true that these two incidents — LinkedIn checking into Pealk’s background and a designer giving the app a full run out — can be viewed as positives which saw LinkedIn dig into more details about a prospective partner, they can also be interpreted as the company sussing out the possibility that it launch a similar app without causing controversy by cutting into a VC’s investment or prompting a legal case. Given the u-turn that occurred days after both incidents, certainly the latter, more sinister explanation has additional credence. Golden believes that, with hindsight, LinkedIn was eyeing up the clout of his company. Pealk has been in contact with lawyers in the event that LinkedIn iterates its own version of the app or reaches out to members of the small team with offers of employment. Despite that, Golden says, the experience hasn’t changed his admiration for LinkedIn or the fact that the startup would like to restart the relationship and get back to discussing collaborations with the social network. However, with LinkedIn looking to increase its commitment to third parties and open its own app store soon, Golden has advice for would-be developers wanting to take advantage of its API. LinkedIn has been criticised in the past for switching off API access in questionable circumstances, and last June it shut out five services that appeared to compete with its own offering: Facebook-focused career network BranchOut, brand management app Visible.me, Monster’s social recruiting program BeKnown, professional reputation service Mixtent and the resume service Daxtra. LinkedIn said BeKnown, Mixtent and Visible.me were blocked from LinkedIn’s API because they were using it to send promotional messages, which means profiting from access to its API, a violation of TOS. And LinkedIn said since BeKnown was also charging for enterprise services that relied on the API, it, liked BranchOut was in effect charging for access to LinkedIn content. As we suggested in our initial post, Pealk has similarities to LinkedIn’s own premium services. A number of the app’s most glittering reviews have come from sales, HR and recruitment professionals, all of whom LinkedIn would prefer use its services for recruiters (ranging from $49.95 to $499.95 per month) and services for sales professionals (from $19.95 to $99.95 per month). “The truth is that we strongly believe we were finally a threat to them. Some people have said that they have ‘LinkedIn Recruiter’ accounts and that they like Pealk better,” Golden says. Golden’s comments are particularly interesting as they embody the rationale behind opening APIs and other data up to third party developers, the idea is to tap fresh brains and creativity to help innovate a service’s user experience. Apps like Pealk bring a new dimension to LinkedIn for many of its users. While the threat of rivals like BranchOut, who were monetising its service for their own good, is perhaps understandable, it is hard to see how a promising, niche app — whose 2,500 users is a fraction of 150 million plus membership base — can warrant the shoddy treatment that LinkedIn has given Pealk. Working with company APIs is all about trust, from both sides. For the company, the main issue is that third-parties use data responsibly, while developers need to know that their innovation and ideas will be respected. The fact that Pealk has produced an app that innovates on what LinkedIn already offers, should mean that the company treats the company well and respects it for injecting fresh ideas. The company showed this side of its relationship early on, when it provided positive feedback, reached out to the team and discussed possible collaborations. That is the kind of treatment that makes developers feel valued and want to work with companies. However, flipping 180 degrees, refusing to help and then revoking access goes against that principle. While equally, Golden is frustrated that LinkedIn’s press statements have painted Pealk as a bad guy, after the company said the app is being shut down to “protect members’ data”. At fast glance, that rationale seems feasible as sales and headhunting is often a spammy business — both on and offline — but in reality, LinkedIn’s move can, at best, be interpreted as cutting out a rival service or, at worst, that is is working to copy the innovation and work of a ‘small guy’ with zero credit. Pealk is a fledgling firm that has invested time and money in helping improve the LinkedIn ecosystem, and addressing issues it saw in the service. While swiping away API access for BranchOut is one thing, snuffling the grassroots startups that innovate the service is entirely another, and it serves as a warning for other LinkedIn-focused developers. As we mentioned, the company has plans to open an app store and it is proud of its relationship with developers, ironically it chose today to announce an extension of its female hackday initiative – but Pealk’s story raises serious question marks over its attitude towards the development community. In the course of researching this article, we spoke with other companies and independent developers who have used the LinkedIn API and none expressed their surprise that LinkedIn might be blocking out a competitor. Their feedback was clear, they’ve never had a bad relationship with LinkedIn because they have always tried to avoid rivalling it in any way. While that’s a reasonable and risk-averse bet, we can’t help but feel that LinkedIn should be welcoming all innovation if it wants to improve its service. What should LinkedIn have done? It seems clear that LinkedIn was internally very divided about Pealk. On the one hand, a number of its staff took an interest and used the app — with its developer team reaching out positively — but on the other side of the coin, Golden believes that members within its premium teams wanted the possible rival shut down. Given 5-man Pealk’s relatively modest size, LinkedIn could have looked into hiring the firm and its staff. If it wasn’t that sure on the viability of an acquisition/aquihire, it could have continued to plot a partnership to explore possibilities. Internal conflict aside, the app remained a niche with limited threat. It could have been a chance to see how certain features would be received by a wider audience in preparation for the introduction of a more official product at later date. Assuming that the rivalry is what closed it down, LinkedIn could have been transparent with its reasoning and come clean on exactly why Pealk is having its API access cut, as it did with Branchout and others. As it stands, the whole episode is unsavoury and paints the company in a particularly bad light. With its generalist press statements and refusal to go into specific details, LinkedIn looks like it is trying to bury the news, and provide zero credit to a development team that has taken its service and improved it. (LinkedIn has shown that, despite Pealk’s story, it is committed to work closely with third party developers with the recent partnership with Hookflash, a messaging and video app that integrates contacts and profiles from the professional social network. We’re quite sure that — given the issues it has had of late, which now include a $5 million lawsuit — this isn’t an image that the company wants and, as passionate Golden has said, the door is not closed and Pealk would welcome the chance to end this mess and get working with LinkedIn again. LinkedIn rivals like fellow French service Viadeo would do well to get in touch with Pealk, its API access lapses next Tuesday (June 26) when its innovative brains will be set on finding areas of opportunity that lie elsewhere. In this context, statements from LinkedIn such as those quoted above are prejudicial to Pealk, which therefore reserves its rights to initiate any necessary actions to preserve its interests. Update [06/23]: LinkedIn has provided The Next Web with further details that it says explain why Pealk will have its API access cut, and clarify that the firm was warned in advanced of the shut down. LinkedIn clearly communicated to Pealk that they were in violation of our terms of service well in advance, and they were notified to remove their LinkedIn integration. In response to our communication that they needed to remove LinkedIn data, Pealk in turn introduced new features that further accessed LinkedIn information. We’ve also updated the article in light of the company explaining that it does not enable ‘firehose’ access for developers. LinkedIn has never offered firehose access to our platform. We purposely have throttles in place as part of our open developer program to protect our member’s data. While there is no doubt that LinkedIn is entirely within its rights to withdraw access to the API, the main question mark is over the way that the two services interacted in the run-up to the cut-off. Pealk maintains that the notification of the cut off came “out of the blue” and in contrast to very positive talks, LinkedIn declined to go into details on a specific user case, but it maintains that it contacted Pealk to inform them of the cut off in advanced. LinkedIn also says that Pealk revised its service in light of the decision, but the features continued to operate in breach of its ToS. From Pealk’s perspective, as Golden admits, building a company based on another’s data can be a risk if your final product is even close to competing with an existing service. Read next: Ever seen a bullet blow through an apple in slow motion? How about a BMW M5?